We’re craving the “saltiness” and sweet brightness of Meyer lemons—we have a big box of them thanks to an San Francisco friend. 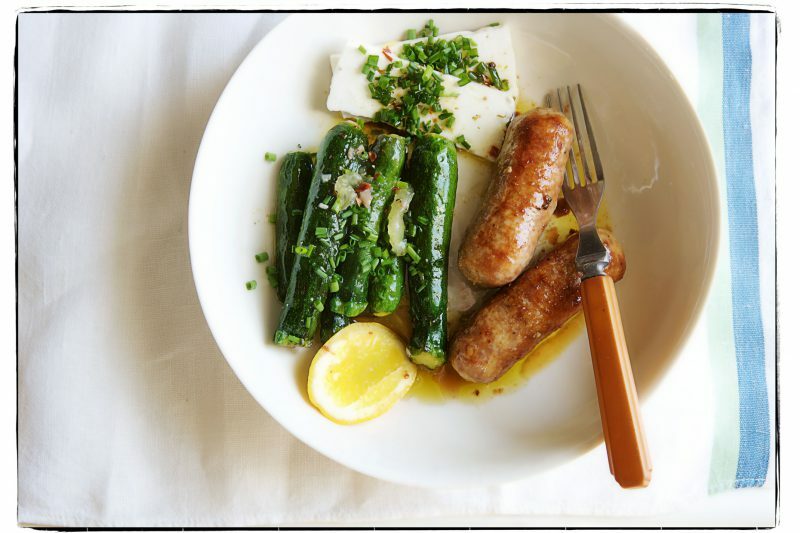 So we pan-fried Italian sausages and poached baby zucchini in olive oil and served them together with slices of feta, lots of chives, and a spoonful of our lemon-supreme dressing from Canal House Cooking, Volume N° 8, Pronto! We’re hungry for greens, veg, and vitamins. 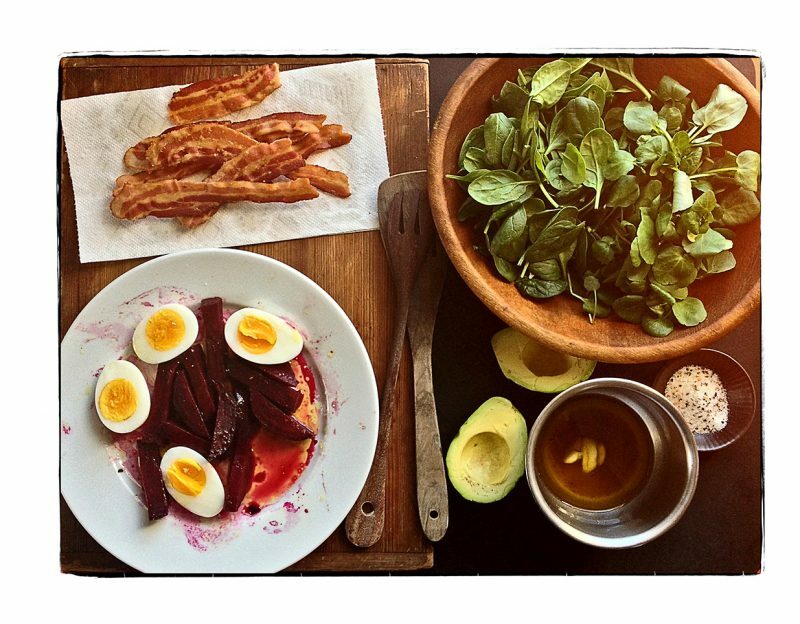 So lunch must be a salad—cress and spinach, an avocado, beets and local eggs, with thin, slices of crisp Applegate bacon—sourced from our local health food store. We made a dressing with a little rendered bacon fat, olive oil, our very own red wine vinegar, a smashed piece of garlic, a pinch of sugar, Angelo Garro’s Omnivore Salt, and pepper. 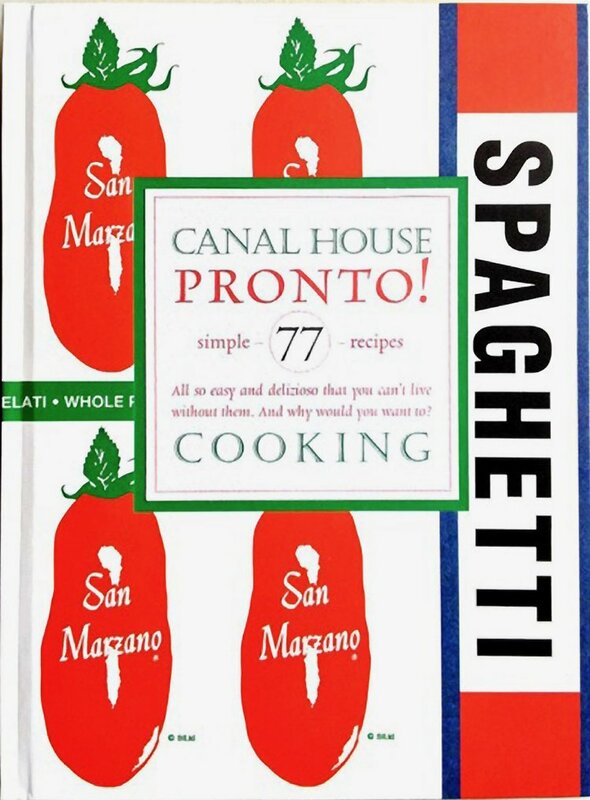 Lots of ingredients, one splendid salad. We feel better already. It’s slim pickings at the supermarket these days, the vegetable bins are tired, and cabbage just isn’t turning us on right now. But here’s what we found that did: a fat head of escarole and a package of pork ribeye chops. 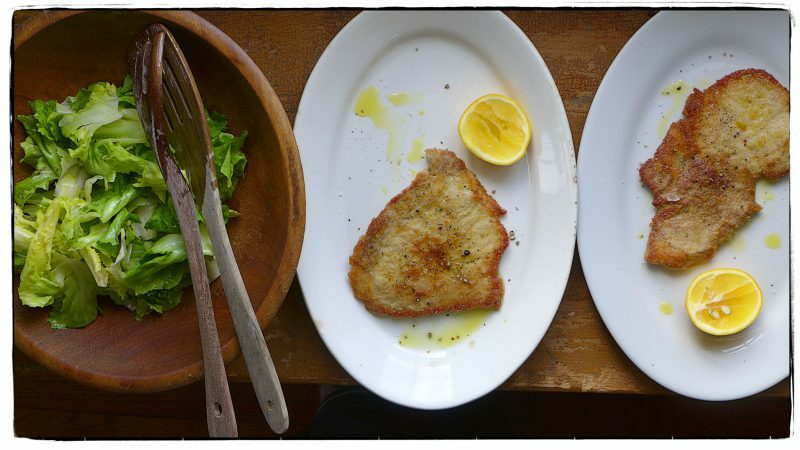 We pounded out the pork to make thin cutlets, then panfried them in good olive oil, and served them with a lemony escarole salad. Snow flakes the size of goose feathers flurried down as we ate. We put a big heavy pot filled with chipotle-and-salt-rubbed brisket and lots of sliced onions into a slow oven on Wednesday, the afternoon before the big snow storm. It kept the kitchen warm and its rich aroma lifted our spirits. When it finished cooking, we buried the pot in the snow. Yesterday was spent digging out pathways and cars before evening brought on more snow, and yes, thunder and lightening. (Surely, we thought, frogs and locusts were to follow!) This morning was all sunshine and light and mild enough outside to melt the snow and all our cares away. So, you may be wondering, whatever happened to that buried pot of brisket? We dug it out, brushed off the snow, and reheated it on top of the stove for lunch. 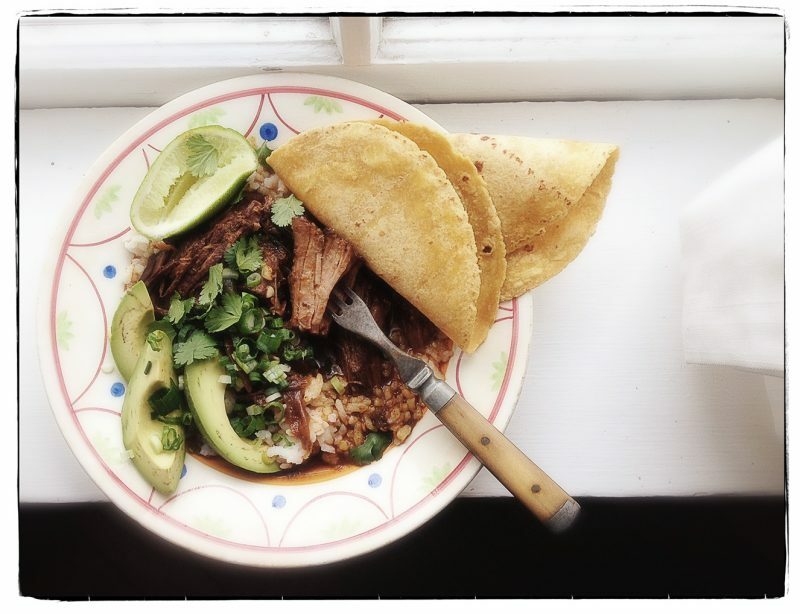 We spooned big pieces of the tender, spicy meat and flavorful broth over rice, and served it with avocados, scallions, cilantro, wedges of lime, and soft corn tortillas to scoop up all the goodness. Happy Valentine’s Day, dear friends. Hope something this spicy comes your way too! Just back in the studio after travels to San Francisco, Yosemite, and Nashville. Everywhere we went we indulged in delicious food and drink—Dungeness crab, sand dabs, Hog Island oysters from Tomales Bay, rabbit cannelloni, Cowgirl Creamery’s Mt Tam cheese, and too many Jack Daniels cocktails. We came back to an empty fridge, so we pulled out a container of our bolognese from the freezer. 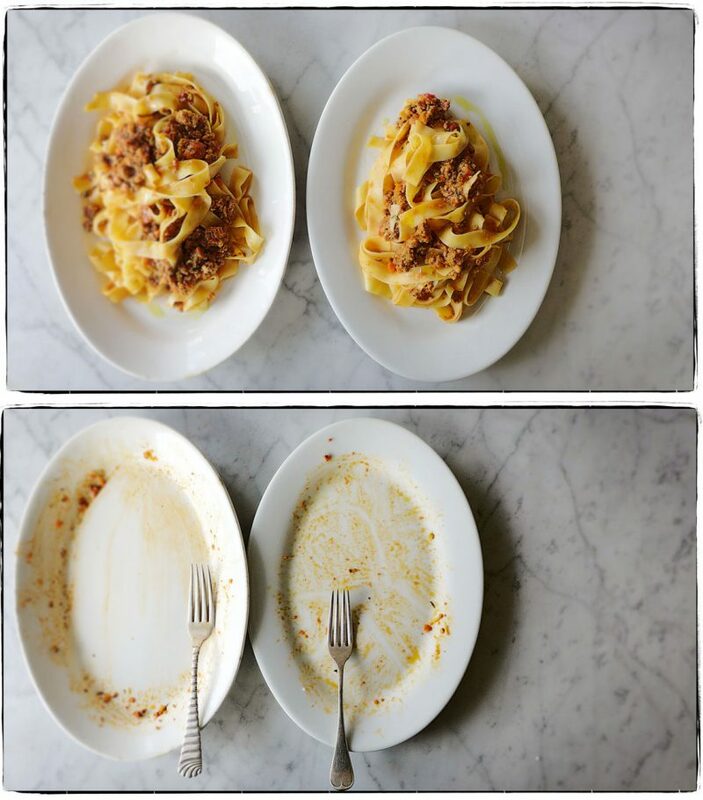 Lunch was two fine plates of pasta. We ate by the fire with our feet on the hearth and one of us licked her plate clean. It sure feels good to be home.